A truck lodged on the M1 exit ramp to the Newcastle Link Road, is continuing to block north bound traffic. The semi-trailer became stuck around 4:30 this morning on the M1 overpass at Cameron Park, when the structure it was carrying was too wide to fit through the barriers. All northbound traffic has been diverted to George Booth Drive. 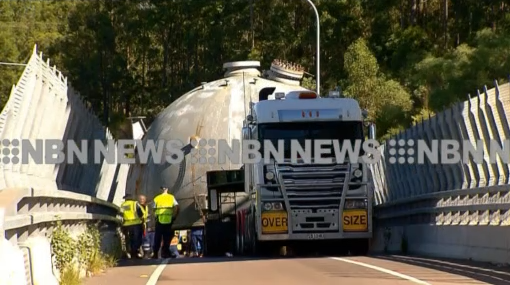 The truck was travelling from the Sydney suburb of Clyde to Newcastle Port where its load was to be exported. A 400-tonne crane has been dispatched from Sydney to attempt to lift the load off the ramp. Intermittent closures are taking place on the M1 northbound as the salvage efforts continue.